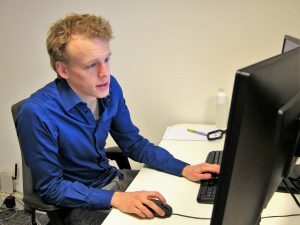 In this post we put the spotlight on Marco Swierstra, project engineer at Femto Engineering, as part of our series to introduce people who help shape our company. Take a moment to read about Marco’s experiences! In October 2017 I started working at Femto Engineering after I graduated from Mechanical Engineering at the TU Delft. My thesis project was about the post-processing of topology optimized results. As a result of this project, I produced a piece of code which comes up with smooth, crisp and optimized geometries. Only 2D cases were studied during my thesis, but in collaboration with the Mechanical Engineering faculty the project was extended to study 3D cases as well. I work on this research parttime at Femto. Femto has a supportive role in the FEM-community and understands research is important to give our customers a leading position and the best support. Besides my research on structural optimization, I work on a variety of commercial projects. Femto supports a wide range of clients in different branches varying from offshore to aerospace to the medical devices industry. We offer a complete solutions which is something I like about working at Femto. Specializing in different subjects in the field of engineering is part of being a Femto engineer. Which simulation software do you use for your projects? I use Simcenter 3D for my current project. Recently, Simcenter 3D added a topology optimization tool. This Simcenter tool offers several possibilities to optimize for instance material properties and wall thicknesses. Furthermore, the flexibility of Simcenter 3D in switching between geometry (CAD) and model (FEM) is very convenient if design changes need to be made. All these aspects are beneficial in my work. What do you see as the emerging trends in your field of expertise? Structural optimization procedures, such as topology optimization, are usually relevant with structures which are not very suitable for conventional manufacturing methods. Additive manufacturing, like 3D-printing, is a possibility nowadays and provides a great addition, to for example, milling. In the field of (topology) optimization I am expecting improvements regarding the manufacturability of the optimized results. For example, a manufacturing constraint is already available in Simcenter 3D which deals with overhang of structures, and there are other constraints emerging to overcome a variety of difficulties in the manufacturing of optimized structures. Not only constraints are added for additive manufacturing, but also constraints regarding different, more conventional, manufacturing methods. Some parts require to be produced en masse, making additive manufacturing less of an option. Making the optimization algorithms able to come up with designs suitable for molding, is also a huge improvement in terms of manufacturing. Usually clients consult us with engineering problems of which the solutions are challenging to solve. What I enjoy most within my field of expertise is the combination of working for a variety of customers on a high level of topics that are never the same. Thanks for reading this post! If you are interested in our services or in an open position at Femto, please do not hesitate and contact us!